The Repetek Nature Reserve was founded in 1927 and occupies a territory of more than 35 000 hectaresto study unique desert fauna and flora. It is located in the central part of the eastern Karakum. The unique natural ecosystem of Repetek attracted the attention of many scientists and a number of scientific conferences and seminars were held here. The importance of Repetek was recognized by UNESCO and in 1979 Repetek obtained the status of an International Biosphere Reserve. 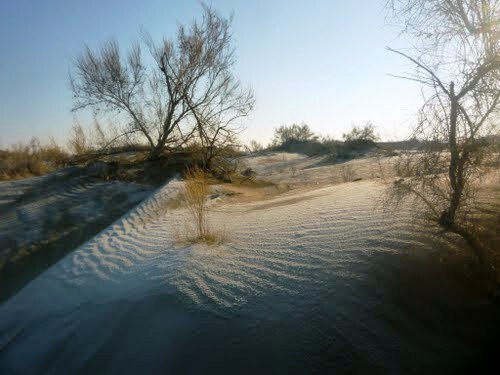 Repetek is a place where we can observe practically all forms of the Karakum’s sandy landscape, which are dune-like, ridge-like, hilly and other possible variations, as well as striking the attention ‘Repetek Sahara’ and groves of white and black saxaul (haloxylon) - a forest without a shade. 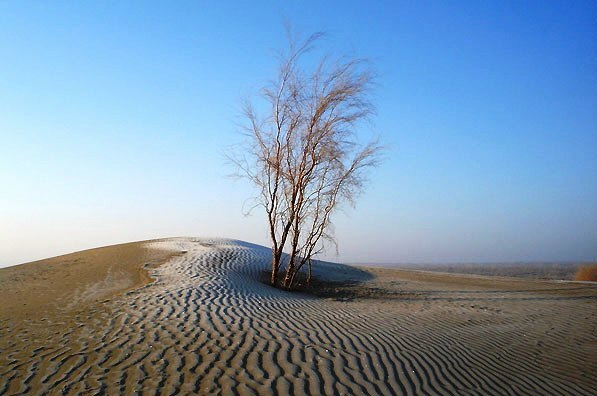 Saxaul is a tree without leaves. It has leaves, but they are very thin. It helps the saxaul tree to withstand the extremeness of temperature and harsh climate. Repetek is blessed with more than 240 sunny days a year and the temperature of the sandy surface is often 80 degrees Celsius. Turkmen consider saxaul tree the best to make a fire in a tandyr, where they bake the traditional round bread ‘churek’. Other interesting trees in the Repetek are silver acacia, weeping willow. The Repetek Nature Reserve is home to an amazingly diverse array of fauna. There are 300 different species of beetles, 160 species of butterflies, spiders. The venom of the Karakurt spider is 8-9 times stronger than that of cobra and its bite is much more dangerous than scorpion, phalanx and tarantula. The ornithology-fauna consists of more than 160 species of birds and among them are saxaul jay, a golden eagle, owl, falcon, buzzard, kestrel etc. Only in Repetek you can observe four different species of sparrow. Repetek is a kingdom of reptiles. There are 30 species of lizards, 9 species of snakes and tortoises. Among mammals are foxes, gazelles, steppe and dune cats, porcupines, jerboas, ground squirrel, jackals.